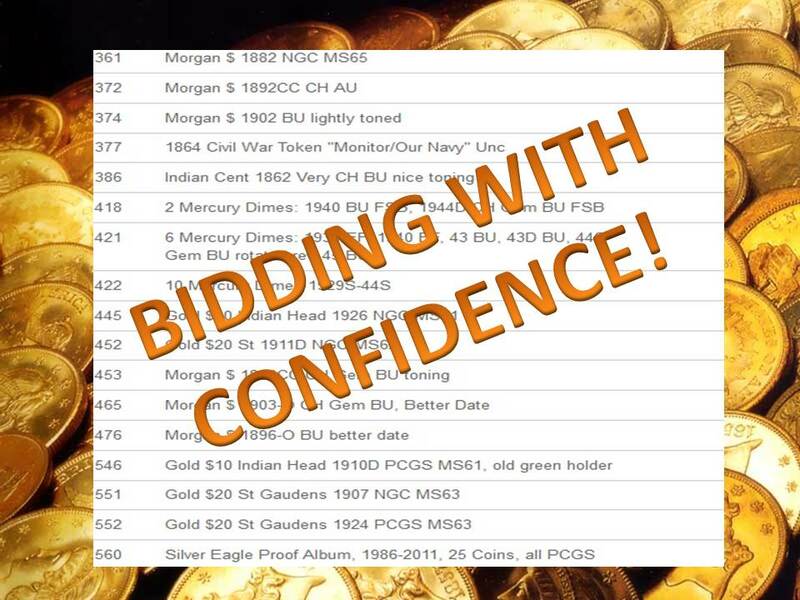 We’ve all heard the auctioneering phrase, “Bid with Confidence!” There is no greater feeling than placing a high maximum on a coveted coin in an auction you can trust. Yesterday, Proxiblog bid on several coins in the March 13 Weaver Signature Coin and Currency auction, winning 8 of 11 under maximum bid. But we knew that going into the session because we have bid on Weaver auctions for more than two years. However, we also won several lots significantly under maximum bid in a new auction we have begun patronizing, Brian’s Auction Service of Vandalia, Ill.
Because of that confident feeling, we just breezed through two upcoming Weaver auctions, on April 26-27, bidding high because we trust our consistent under-maximum results. We’ll be looking for future Brian Auctions (and encourage him to lower his current 16% online buyer’s fee to 15% so he can be listed on our Honor Rolls). And then there’s this: Later tonight we’re looking forward to another auction by top house Western Auction of Cheyenne, Wyo. We’re also testing another new Proxibid auction already on our Honor Rolls, featuring a 15% online buyer’s fee with good photos and reasonable shipping. We’re hoping to see under maximum bids there, too. If not, we’ll just not bid there anymore. If so, we’ll be a return customer. We hope the hundreds of Proxiblog regulars, both bidders and auctioneers, consider the importance of the phrase “Bid with Confidence!” We also hope certain houses drop the practice of seeing maximum bids and allowing consignor bidding. True, we still patronize those auctions and include them in our rankings; but we take our time with bids, even when those houses have sold under maximums (and many do). We look up auction prices on PCGS Coin Facts (a must for serious bidders) and carefully figure out buyer’s fee and shipping charge. Result? We bid on fewer lots (otherwise, it just takes too much of our time). That’s called “Bidding with Caution.” We’ll take “Bidding with Confidence” any day! This entry was posted in Best Practices, Featured Updates and tagged American Numismatic Association, Auctioneers, AuctionZip, Best Practices, Brian's Auction Service, Coin Auction, National Auctioneer Association, PCGS Coin Facts, Proxibid, Proxiblog, Weaver Signature Coin and Currency Auction, Western Auction. Bookmark the permalink. If Proxibid would LOWER their fees, then the auction would not have to charge such a high %!!! !